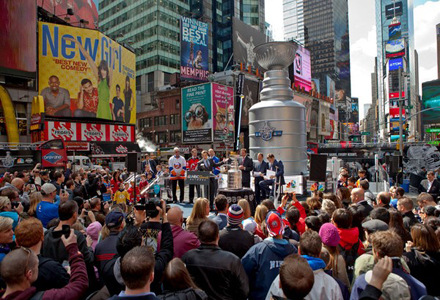 To promote its coverage of the NHL’s Stanley Cup Playoffs, which kicked off on April 11, NBC Sports built a giant replica of hockey’s prestigious Stanley Cup and placed it in the middle of Times Square for three days (April 11-13) where it functioned as a working water fountain. 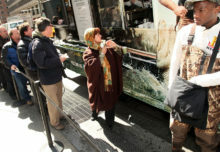 The fountain was a nod to New York City’s high-quality tap water, which is often credited as the reason why the Big Apple’s bagels are the “best.” Consumers could drink water from specific spouts at the base of the fountain with reusable souvenir cups handed out by a NBC Sports, NHL and NYC Water team. The fountain, in partnership with NYC Department of Environmental Protection’s Water-on-the-Go, pumped out 120 gallons of water per minute. “You can produce a great commercial and it’s very effective, and you do get coverage sometimes for it, but with this there is a multitude of the people spreading the word for you,” Bill Bergofin, svp-marketing at NBC Sports, whose team also commissioned life-size chocolate Stanley Cup replicas from renowned chocolatier Jacques Torres to be delivered to local media outlets as part of the campaign, told Buzz. “NHL Live” host Liam McHugh emceed the unveiling ceremony on April 11 of the 21-foot high and 6,600-pound trophy, which featured 12 industrial fountain pop jets in the upper bowl that shot water six feet above the cup. Three previous Stanley Cup winners—former New York Ranger Adam Graves, former New York Islander Clark Gillies and former New Jersey Devil Grant Marshall—were also part of the ceremony. “We have seen significant coverage both locally and nationally for the stunt. And, ratings so far are on the uptick from last year’s Playoffs,” Bergofin said. 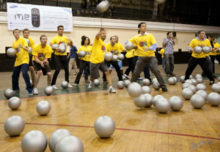 Agency: Civic Entertainment Group, New York City.